The church staff is here to help you with whatever needs or concerns you may have. Simply call, email, or visit us in person during office hours. Besides the pastor and church secretary, you may also communicate your messages, ideas, compliments or complaints with any member of the Church Council, who will relay your message to the appropriate personnel. 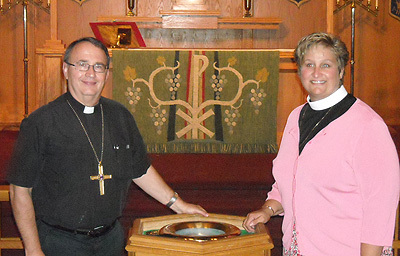 Pastor Mary Beth Smith-Gunn was installed at Trinity Evangelical Lutheran Church on August 31, 2008. She currently resides just outside Bryan with her husband Jeff, and her two children Josh and Rachel. Church Secretary/Office Manager: Rhonda Fackler handles all daily office functions as well as the coordination and mailing of the monthly Trumpet newsletter, and the weekly worship bulletins. The Parish Ed Director is Julie Taylor. For more information, please see our Education page. The Church Council consists of fifteen members and the Pastor.